The stability of the boundaries between plates is dependent upon their relative velocity vectors. If a boundary is unstable it will exist only instantaneously and will immediately devolve into a stable configuration. Figure 5.19a shows an unstable boundary between two plates where plate X is underthrusting plate Y at bc in a northeasterly direction and plate Y is underthrust-ing plate X at ab in a southwesterly direction. The boundary is unstable because a trench can only consume in one direction, so to accommodate these movements a dextral transform fault develops at b (Fig. 5.19b). 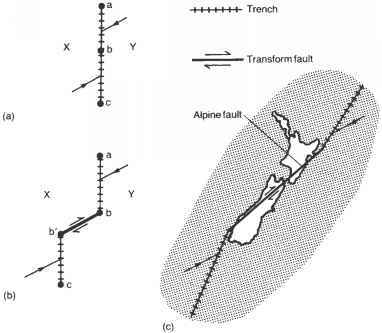 This sequence of events may have occurred in the develop ment of the Alpine Fault of New Zealand (Fig. 5.19c), which is a dextral transform fault linking the Tonga-Kermadec Trench, beneath which Pacific lithosphere is underthrusting in a southwesterly direction, to a trench to the south of New Zealand where the Tasman Sea is being consumed in a northeasterly direction (McKenzie & Morgan, 1969). A more complex and potentially unstable situation arises when three plates come into contact at a triple junction. Quadruple junctions are always unstable, and immediately devolve into a pair of stable triple junctions, as will be shown later. Figure 5.19 (a,b) Evolution of a trench. (c) Alpine Fault of New Zealand (redrawn from McKenzie & Morgan, 1969, with permission from Nature 224, 125-33. Copyright © 1969 Macmillan Publishers Ltd). Figure 5.21 (a) Trench (T) between plates A and B; (b) its representation in velocity space with the velocity line ab corresponding to its related triple junction. down the three boundaries between pairs of plates. It is easier to visualize the conditions for stability of the triple junction if each boundary is first considered individually. Figure 5.21a shows the trench, at which plate A is underthrusting plate B in a northeasterly direction. Figure 5.21b shows the relative movement between A and B in velocity space (Cox & Hart, 1986), that is, on a figure in which the velocity of any single point is represented by its north and east components, and lines joining two points represent velocity vectors. Thus, the direction of line AB represents the direction of relative movement between A and B, and its length is proportional to the magnitude of their relative velocity. Line ab must represent the locus of a point that travels up and down the trench. This line, then, is the locus of a stable triple junction. B must lie on ab because there is no motion of the overriding plate B with respect to the trench. Now consider the transform boundary (Fig. 5.22a) between plates B and C, and its representation in velocity space (Fig. 5.22b). Again, line BC represents the relative velocity vector between the plates, but the locus of a point traveling up and down the fault, bc, is now in the same sense as vector BC, because the relative motion direction of B and C is along their boundary. 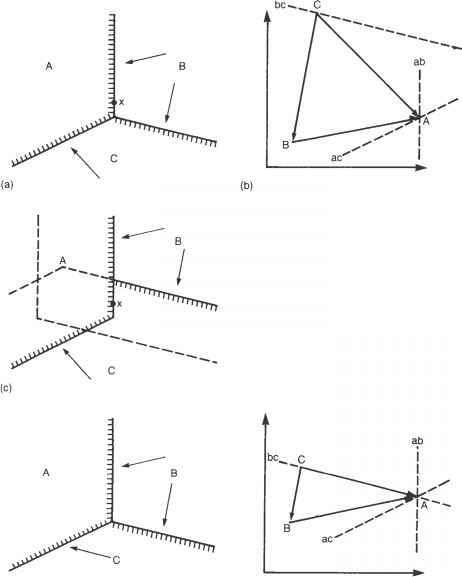 Figure 5.22 (a) Transform fault (F) between plates B and C; (b) its representation in velocity space with the velocity line bc corresponding to its related triple junction. Figure 5.23 (a) Ridge (R) between plates A and C; (b) its representation in velocity space with the velocity line ac corresponding to its related triple junction. of velocity vector CA if the accretion process is symmetric with plates A and C each moving at half the rate of accretion. By combining the velocity space representations (Fig. 5.24), the stability of the triple junction can be determined from the relative positions of the velocity lines representing the boundaries. If they intersect at one point, it implies that a stable triple junction exists because that point has the property of being able to travel up and down all three plate margins. 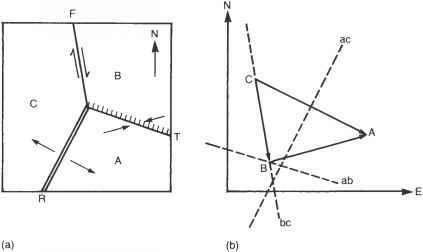 In the case of the RTF triple junction, it can be appreciated that a stable triple junction exists only if velocity line ac passes through B, or if ab is the same as bc, that is, the trench and transform fault have the same trend, as shown here. If the velocity lines do not all intersect at a single point the triple junction is unstable. The more general case of an RTF triple junction, which is unstable, is shown in Fig. 5.25. Figure 5.24 Velocity space representation of the plate system shown in Fig. 5.20. 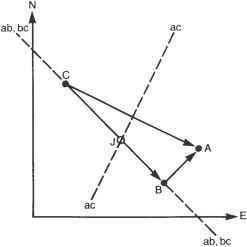 Velocity lines ab, bc, and ac intersect at the single point J, which thus represents a stable triple junction. Figure 5.25 (a) Ridge (R)-trench (T)-transform fault (F) triple junction between plates A, B, and C. (b) Its representation in velocity space. As the velocity lines ab, bc, and ac do not intersect at a single point, the triple junction must be unstable. different times and locations along the plate boundary. In order to be stable, the plate configuration shown in Fig. 5.26a must be as in Fig. 5.26d. When plotted in velocity space (Fig. 5.26e) the velocity lines then intersect at a single point. Figure 5.26 (a) Triple junction between three trenches separating plates A, B, and C. (b) Its representation in velocity space, illustrating its instability. (c) The positions plates B and C would have reached if they had not been consumed are shown as dashed lines. (d) Stable configuration of a trench-trench-trench triple junction. (e) Its representation in velocity space. ((a) and (c) redrawn from McKenzie & Morgan, 1969, with permission from Nature 224,125-33. Copyright © 1969 Macmillan Publishers Ltd). 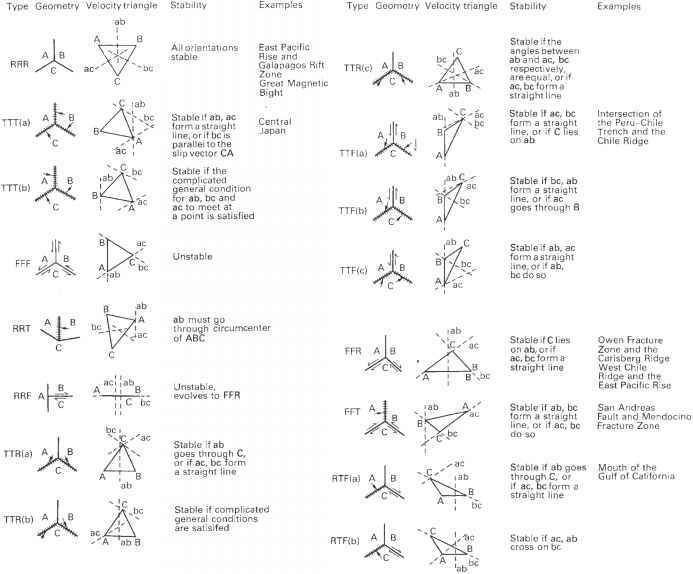 Figure 5.27 Geometry and stability of all possible triple junctions (redrawn from McKenzie & Morgan, 1969, with permission from Nature 224,125-33. Copyright © 1969 Macmillan Publishers Ltd). Figure 5.28 Evolution of the San Andreas Fault (redrawn from Cox & Hart, 1986, with permission from Blackwell Publishing). single point (the circumcenter of the triangle). The FFF triple junction is never stable, as the velocity lines coincide with the vector triangle, and, of course, the sides of a triangle never meet in a single point. The other possible triple junctions are only stable for certain particular orientations of the juxtaposed plate margins. Why a RRR triple junctiom is stable? When TTT plate junction is stable? What are d stable triple junction? When triple junction is stable and unstable?